There aren’t many musicians out there who could pull off a song acknowledging some of the biggest names in Chicago blues without coming across as somewhat opportunistic or trite. 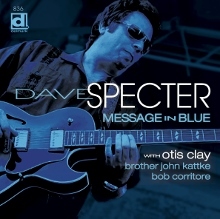 But Chicago native guitarist, bandleader, and producer Dave Specter manages to do it with integrity on a tune called “Chicago Style”, one of eight new original tracks you’ll hear on Specter’s latest album Message in Blue (Delmark Records). Even though it’s not Specter himself singing the tune (Specter has yet to sing on any of his ten recordings, handing the mic in this instance to fellow Windy City multi-instrumentalist and vocalist Brother John Kattke), there’s no mistaking that the words are genuine, with Specter demonstrating throughout the album the talent and experience that made it possible for him to share the stage with many of the legends Kattke names during the song, from Junior Wells, Buddy Guy, and Lonnie Brooks to Otis Rush, Sunnyland Slim, Mighty Joe Young, and soul crooner Otis Clay, the latter of whom joins Specter on three songs here, starting with a swinging take on Harold Burrage’s “Got to Find a Way” that also features the Chicago Horns and some fine female backing vocals. That’s followed immediately by a soulful creeper in the Bobby “Blue” Bland classic “This Time I’m Gone for Good”, where Specter’s pleading guitar nicely matches that of Clay’s vocals as Kattke’s keyboards resonate underneath, and a bit later by a swaying “I Found a Love” (Wilson Pickett and the Falcons), with Specter’s expressive guitar work and Clay’s chalky, soulful vocals making it hard to find one any better than this. That said, Kattke also does an admirable job on vocals for several songs; in addition to the aforementioned “Let the Good Times Roll”-like “Chicago Style” on which he rattles off the names of some of Chicago’s finest, Kattke’s strong, no-nonsense vocals can also be heard on covers of both the Don Nix-penned “Same Old Blues” (Freddie King) and Lonnie Brooks’ “Watchdog”, a shuffle similar to the earlier “Chicago Style”. As great as the vocals on this album are, the truth is that Specter really doesn’t need himself or anyone else singing in order to get your attention, allowing his guitar to serve as his voice on a bunch of terrific instrumentals, from the greasy Chicago swagger of the opening “New West Side Stroll” – an update on Specter’s own earlier “West Side Stroll” – to the muddy, impassioned grooves of the title track and the funky guitar tones of a The Meters-influenced “Funkified Outta SPACE” that also features some superb work from Kattke on organ. The band adds Victor Garcia on congas and percussion for a pair of Latin-flavored originals in “The Stinger” and the soft, jazzy “The Spectifyin’ Samba”, with John “Boom” Brumbach providing some smoky tenor sax on the latter, while Specter welcomes fellow Chicago native Bob Corritore on harmonica for both a lively “Jefferson Stomp” that’s probably among the album’s best numbers and the creeping closer “Opus de Swamp” on which Specter’s tremelo guitar could easily be mistaken for that of Gary Clark Jr. Recorded in August 2013 at Delmark’s Riverside Studio in Chicago, Message in Blue is the label’s first new blues recording to be released on LP since Specter’s 1991 Bluebird Blues featuring fellow guitarist Ronnie Earl, who you might consider Specter sort of a Chicago version of. Like another Chicago musician’s album about which we told you recently, this is one of those sets that makes you feel like you’re right there for it. With a variety of blues, soul, funk and jazz sounds and plenty of fat, rich notes, this Message from Specter is one everyone should hear. This entry was posted in Albums and tagged Bob Corritore, Brother John Kattke, Chicago Horns, Dave Specter, Otis Clay. Bookmark the permalink.